Easy Bake Ultimate Oven - You can be just like TV show chef stars and your own cake and cupcake boss. Dippin Dot Maker - Frozen dipping dots ice cream machine. Easy Bake Microwave - Style kit's safe baking technique uses existing microwave oven. Blizzard Maker - Ice cream treats made at home. Play-Doh Fast Food Maker - Burger builder playset makes pretend potato chips too. Girl Gourmet Cake Bakery - Easy way to make designer cakes that bake in the microwave in 30 seconds. Big Top Cupcake - Giant cupcake maker. Ice Cream Sandwich Maker - Girl Gourmet tool to make your own ice cream sandwiches. Girl Gourmet Cupcake Maker - Bake cupcakes in your microwave and decorate with this baking kit. Slurpee Drink Maker create slurpees by adding ice and soda or juice to the automatic 7-11 flavored slush beverage machine. Dora's Talking Kitchen interactive play kitchen includes seven recipe adventure maps and forty-four talking phrases. Hershey Smores Maker classic campfire treat made right at home from chocolate bars, marshmallows, and graham crackers. Magic Talking Kitchen crew electronic play food toys make fun sounds for kids in interactive imaginary pretend cooking. Barbie Kitchen - Barbie play kitchen. Baskin Robbins Ice Cream Maker - Baskins - Make Delicious Baskin-Robbins Ice Cream at home in less than ten minutes. Calico Critters Kitchen Set - with 40 accessories. Doll Kitchen Furniture - 1:12 Scale doll furniture. Easy Bake Blender - Whip up a batch of cherry parfait in a kid-sized blender. Easy Bake Oven and Mixes - Easy Bake Oven Kits. Electronic Victorian Kitchen - Wall kitchen set. 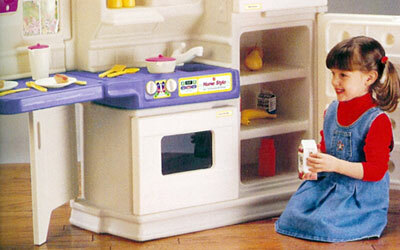 Fisher Price Kitchen - A pretend kitchen with all the basics. Fisher Price Sweet Magic Kitchen - Play kitchen with music and color changes. Fisher Price Water Magic Kitchen - Kitchen with realistic boiling action. Icee Maker Icey Icy - Great refreshing drinks. Little Chefs Kitchen Meals - Plastic play foods. Little Tikes Cooking Sounds Gourmet Kitchen - 11-sound electronic kitchen center. Little Tikes Discover Sounds Kitchen - Interactive kitchen with delicious activities and electronic sounds to stimulate baby's imagination. Magic Talking Grill - The grill with a bunch of buddies built in by Playschool (Playskool). Play Fruit and Vegetables - Play fruits and vegetables for play kitchens. Play Kitchen Super Set - Excellent play kitchen set. Play Pots and Pans - Pots and pans for a play kitchen.